Welcome to Brighter PSA – Innovative, cloud-based Professional Services Automation (PSA) software from Brighter Connections which allows you to gather data, track performance and action change within your professional services organisation. If your business is consultancy based, selling advice, creativity or support, then Brighter PSA can help you maximise profitability. 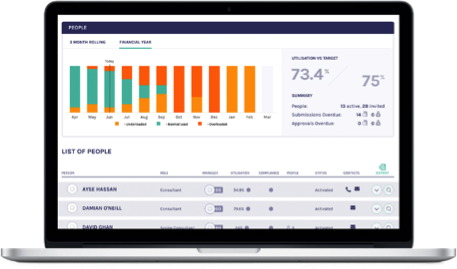 This is achieved by bringing together time, expenses, budgeting and pipeline data into one single, purpose-designed, easy-to-use place and providing actionable insights into this data. What Can Brighter PSA Do for Your Business? 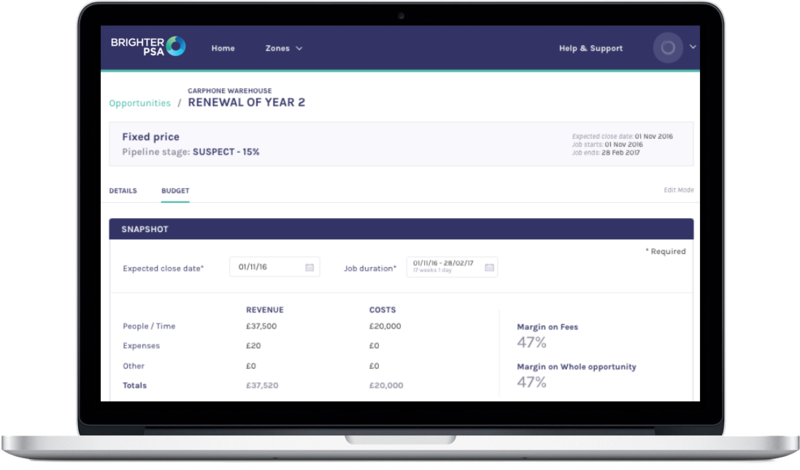 Brighter PSA gives you a view of your business that is very difficult to achieve with spreadsheets and standalone, disparate systems. 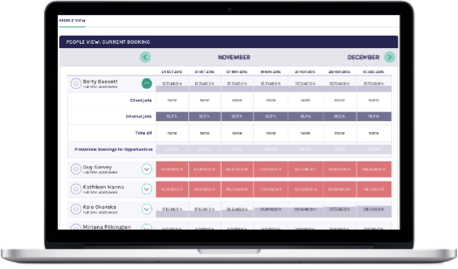 If you are using multiple software products or spreadsheets, which do different jobs and don’t talk to each other, Brighter PSA can make life simpler by giving you an unrivalled view of where your business is and where to take it. 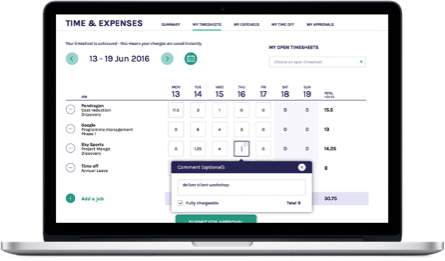 Quickly and easily capture time and expenses and approve timesheets for your team. Brighter PSA can be used on a laptop or mobile app for iPhone or Android for logging time and costs on the move. You can even use your phone’s camera to photograph receipts which you can store and so eliminate paper expense claims and stapled receipts. 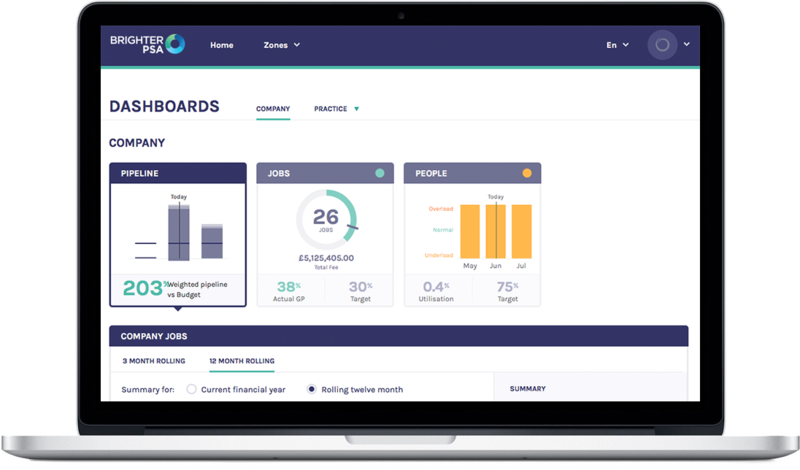 Track the sales performance of your team; look at revenue from pipeline, existing jobs and compare to your business plan. Gain insight into how healthy your active jobs are and the expected profit. Ensure that the value of work is recorded and reported as chargeable and non-chargeable time. Get a view of utilisation across your company, as a whole or by person. See which people are over-loaded, under-worked or working normally. Get a strategic overview of your business and actionable insights so you know where changes need to be made.